L 6 3/4″ (17 cm). Series of soft, twittering notes. Also gives a sharp “pit-vik.” note. 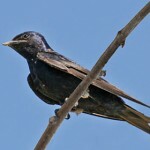 Very long, deeply forked tail; glossy blue-black above; light cinnamon-rust below, with rich chestnut-red throat and forehead; thin blue-black breast band; and white undertail spots. Juveniles are paler overall with a shorter tail, but the tail is still noticeably forked. Habitat: Found in open forests, farmlands, cities, and rural areas. 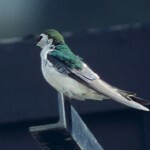 Usually nest on or inside buildings that have horizontal beams available for nest sites. 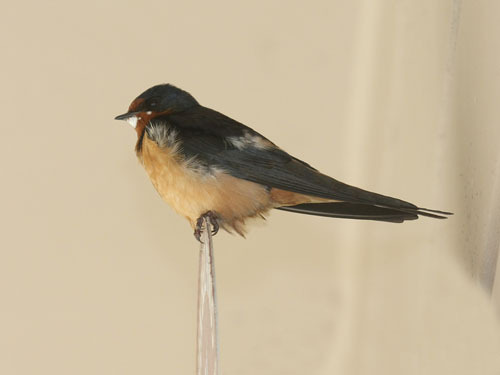 Fun Facts: The Barn Swallow is the most abundant and widely distributed swallow species in the world! 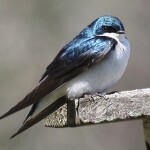 Additional Information: Judging from migration records, the Barn Swallow is the most common swallow in Nebraska as well.